Do you have you a condition that can sometimes make travel difficult? Do you often struggle to get the advice and assistance that you need? You're not alone. Research conducted by Disabled World discovered that tourists with reduced mobility regularly complain of a lack of professional staff capable of advising about accessibility when travelling. When pre-booking parking it's essential you notify the company about your disability prior to travelling. Each car park should have staff on site to help you from your car to the terminal if required. All car parks should have disabled parking bays close to reception and to the shuttle bus pickup points if this service is in operation. 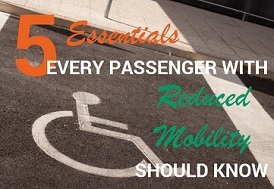 Passengers with reduced mobility should always be supplied with accessibility information at the time of purchasing their plane or train ticket. It's vitally important that you are fully briefed before you set off. Finding exits, the right platforms and the right check in desks is not always easy with reduced mobility. At airports and major train stations special posts are in place for you to make a direct call to the people who can guide you through security and direct you to the correct gate. Assistance should also extend to checking in luggage and transportation to the boarding area. If you have a guide dog that you'd like to take on board, don't forget to give the travel operator advance notice of your requirements. When boarding a plane or train it's important to know where you're seated and staff should be on hand to guide you to your seat. Airplane safety instructions also need to be explained in a way that is adapted to your disability. Do you have a condition that makes travelling difficult? Have an experience you'd care to share? Then leave us a comment on our Facebook page - we'd love to hear from you.